Guest Week 5 begins with this comic from Patrick D. Ryall, aka PDR, creator of The Book of PDR. 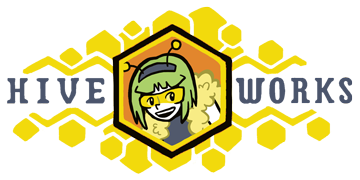 The site not only has comics, but an awesome recurring feature wherein he reviews fictional beekeepers (including Trigona Ambrose, who got 4 out of 5 honeycombs). NOTE: Guest Week 5 schedule will be this Thursday, Saturday, Tuesday, and next Thursday. Be sure to come back on those days! I wish I could have done a guest comic this time. I just had one idea and it didn’t really go anywhere.. and it may have been done already. everyone is cats being cats, beeserker cat misinterprets a line, then scootsie is their fat immobile human owner. I think I’ve turned all the humans into robots and vice versa, but not that.